Congratulations to our partners at the Queensland Government on receiving a 2018 State Merit iAward for ‘MyAccount’. There were many organisations that contributed to the platform, including the Chair in Digital Economy, Liquid Interactive and ThoughtWorks. MyAccount is an example of a proactive approach to government service delivery, one of the focal points of our team’s research. The project will progress to the National iAwards being held in Melbourne on 30 August. 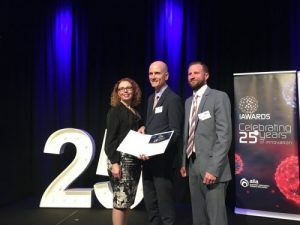 For the past 25 years the iAwards, hosted by the Australian Information Industry Association (AIIA), has recognised excellence in Australian innovation that is creating change and has the potential to positively influence communities. Nominations are accepted from innovators from the whole Australian economy including individuals, groups, government, or private organisations. Through recent and ongoing sprint work, ‘MyAccount’ seeks to provide a personalized and cohesive experience between government services, a government first and the start of a broader transformation. In response, ‘MyAccount’ delivered one place to get easy access to services based on their personal attributes e.g. age, location. This included transactions, renewal reminders, tracking applications, discounts, localised services and concessions from across Government. This is a part of a broader personalisation transformation program, incorporated within the Queensland Government digital platform www.gov.qld.au. The Chair in Digital Economy are proud to have partnered with Queensland Government on this project. Pictured (from left to right) – Irene Violet (Assistant Director-General, Department of Housing and Public Works, Queensland Government), Matthew Radford (Service Integration Manager, Queensland Government) and Ryan Williams (Head of NBN local – Queensland).